I just came across this article about saving money at Whole Foods and it got me thinking about my own tips. shopping at Whole Paycheck” and then you feel as though you’re flaunting wealth (if you are on a budget)? I have had that happen many times, but I don’t really spend that much at Whole Foods. When I do spend a little more it’s because I’m buying some specialty item I can’t find anywhere else. In this article they mention getting free samples. This is totally true. It is a company policy to let customers try items. The idea is that if you like it you’ll keep buying it. I have only had this happen once, when a manager saw me looking at Harmless Harvest Coconut Water and offered a free bottle so I could try it out. And guess what? I still buy it every now and then because it’s the best coconut water I’ve ever had, though it’s pretty expensive so I can’t get it too often. However, I guess I’m a little to shy to outright ask for a sample, so let’s focus on other ways to get of Whole Foods without breaking the bank. The Salad Bar: The salad bar is an easy lunch or dinner option. The main reason I go to Whole Foods is the salad bar. It’s probably the best SCD friendly salad bar around and I know I can eat their roast chicken, so that’s a huge bonus. The salad bar is not that cheap, but since I’m mainly getting vegetables and a little chicken I can keep it light. LARA Bars – Whole Foods has always been one the cheapest places to buy LARA Bars and they always have a huge selection. Only buy what’s on sale price – It’s a pain, but I don’t do all my shopping at Whole Foods. I get what I want there and then go to my regular store for everything else. However, their produce department has a wide selection of organic fruits and vegetables that aren’t always in other stores. So I look and see what’s on sale or a good price that week and I buy that. Same goes for grass-fed meat. Sometimes they have great sales on those items. The rest of my shopping is selective. Whole Foods is the only place I can find Dry Curd Cottage Cheese so I pick that up there. They also are sometimes the only place I can get pasture eggs, cheese, and milk . So I make a point of getting a few things like that a couple times a month. 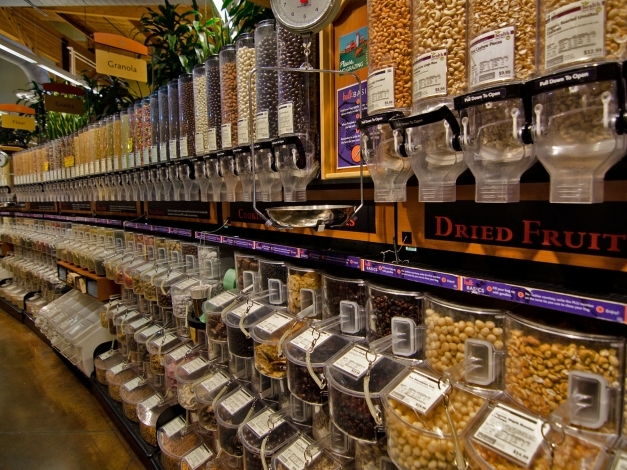 Bulk Foods: Last, but not least, I like getting nuts from their bulk section. This is another place I look for sales. Basically when I shop at Whole Foods I put a limit on much I want to spend and keep my purchases within that amount. If that means I can’t get every single thing I wanted that time, I just get the priorities and save the special items for later. I hope that helps. I have talked to a lot of people who don’t feel they can shop at Whole Foods because of the expense, but you totally can. I’m on a pretty tight budget and I manage to shop there one or two times a month. Great post! 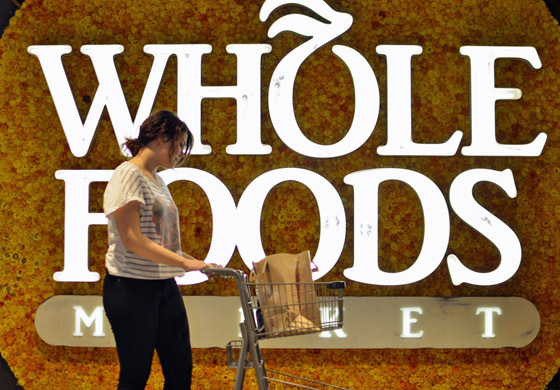 I have found some items are actually cheaper at Whole Foods than at other stores, but it takes some time to figure out where to buy what items. If you have a Natural Grocers store in your area, their prices are much better than Whole Foods. In my area, there is very little employee turnover and I’ve gotten to know the cashiers pretty well. It has a great small town feel in the big city, plus doesn’t break the bank.